Barefoot Cassandra tagged me to tell you six interesting things about myself. The question I have is this; do I not tell at least mildly interesting things about myself every time I post? And if the answer to that question is no then why, pray tell, does anyone happen by here at all? Anyway, I guess I’ll try and round up 6 interesting things but I can’t promise they will be anymore interesting than anything else you’ll find in this here blog as they are all coming from the same source. 1- I like to eat Graham Crackers dipped in lemonade and Cheerios with orange juice. This practice reached it’s height in High School. I don’t remember the last time I had either but I imagine I’d still enjoy both. The other day she soaked a graham cracker in orange juice until it couldn’t hold another ounce of liquid. I found her swabbing the table with the unlikely sponge. As punishment, she was given her choice between eating the mushy cracker, or half an hour of time-out. She chose the time out, and sit there for thirty minutes she did. 2- I love to watch Little People Big World. Not because I have a particular interest in dwarfs, but because I have a particular interest in teenagers and the dumb teenager things teenagers do. My favorite episode is the one where Matt goes out of town and leaves the twins with a list of chores to do. They spend a day and a half complaining about the stupid list, and how there isn’t even enough time for them to do the things on the list so why should they bother with any of it? Then they both fall asleep and nap for eight hours. (The eight hours did not include night time by the way) The next day they get up and do all of the work in half that time. I look at teenagers now with the same anticipation I did toddlers ten years ago. I’m looking forward to a house full of them. I hope they all have crazy hair, bosom friends, and profound thoughts about the life-altering importance of the extra curricular activities they chose to participate in. 3- My eyes are a bit lopsided. It is more just my brows but a but it makes the eyes seem so as well. I first noticed it in a family portrait that was taken when I was in 8th or 9th grade. It was a fund raiser for my sister’s something or other. There was a make-shift “studio” set up in Media Play. You paid a fee through the school organization and then went in to Media Play and they snapped one shot which was printed and delivered a few weeks later. It is the worst picture of me in existence anywhere. 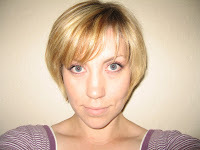 I had a bob with no bangs which I wore parted in the middle and curled under. It was red a-la My So-called Life. I loved that hair style, but I’ve never had it again since I saw that photo. My left eye looked at least 3 times the size of my right and it pulled the rest of my face into the distortion along with it. I noticed while watching “Penelope” that Christina Ricci’s eyes/brows are similarly skewed. It doesn’t bother me on her face the way it does on mine. I guess the bangs covering my right brow make this photo not such a good example but it’s the best I can do. Even if I had access to it, there is no way I would ever post the awful-ness that is the family portrait described above. I remembered who did it too and carried an ounce of scorn for them throughout the remainder of our elementary school careers. I must admit, I was also shocked to find that my teacher said “coupons” rather than “cue-pons” and wondered to myself how a teacher could make such an awful mistake. I was thoroughly ashamed when I learned she was right. 5- It drives me insane when children root around in my kitchen. Baby Girl knows she must ask before opening the fridge and that if she is not setting the table she had best keep her hands out of the utensil drawer etc. Tiny will know that stuff too. Occasionally we have a young visitor who does not know. I have to take lots of deep breaths on those days. 6-I am a bit contrary. Due to this contrariness, that is a part of my soul, I am not going to tag anyone else. So there.